BORG. On April 13, LAURENCE, of Paola (ex-teacher), aged 73, passed away peacefully comforted by the rites of Holy Church. He leaves to mourn his great loss his wife Monica, his children Stephen, Alexander and his wife Marion, grandchildren Nicholas and Benjamin, his sister Jane and her husband Twanny, his brothers Albert and his wife Marianne, Frans and his wife Patricia, his cousins Josephine Cini and her husband Joe, Josephine Bonello and her husband Joe, his brothers and sisters-in-law, other relatives and friends. The funeral will be held tomorrow, Tuesday, April 16, at 9.15am at Santwarju Santa Tereza tal-Bambin Gesu, Birkirkara, followed by interment in the family grave at the Lija cemetery. Donations to Hospice Movement, Malta, and Dar il-Kaptan, Mtarfa, will be greatly appreciated. May the Lord grant him eternal rest. DINGLI. On April 14, at home, MARIA, née Di Benedetto, widow of Carmelo, aged 93, of Sliema, passed away peacefully comforted by the rites of Holy Church. She leaves to mourn her great loss her son Angelo, Diane wife of her late son Peppe, her grandsons Matthew, Ian and his girlfriend Jessica, and all her other relatives and friends. Mass will be celebrated tomorrow, Tuesday, April 16, at 9.30am at Stella Maris parish church, Sliema, followed by interment in the family grave at Santa Maria Addolorata Cemetery. Lord, grant her eternal rest. GIALANZE. On April 13, GILLIAN widow of Dr. Michael Gialanze, passed away peacefully at the age of 65, comforted by the rites of Holy Church. She leaves to mourn her loss her beloved children Nicola, Christian and Gayle, her grandchildren Luke, Sam, Michael, Elly, her in-laws, Miriam Farrugia, Godfrey Gialanze, Maria Gialanze, nephews and nieces, other relatives and friends. 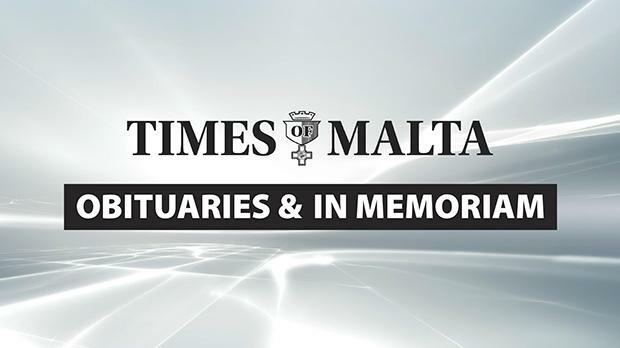 The funeral cortege leaves Mater Dei Hospital on Wednesday, April 17, at 9.30am, for Jesus of Nazareth Parish Church, Sliema where funeral mass præsente cadavere will be said at 10am followed by internment in the family grave at Ħniena Divina cemetery, St. Paul’s Bay. No flowers by request but donations to Dar tal-Providenza, Siġġiewi will be greatly appreciated. Lord, grant her eternal rest. McNAMARA. MICHAEL REX, born in Johannesburg in 1936, sadly passed away on April 12 at Mater Dei Hospital. He leaves to mourn his great loss his wife Diana nèe deCesare, his beloved children Deborah, wife of Nicholas Caruana Turner, Nickie and Alister and Sharron. His grandchildren Cosmo, Michael, Jamie, Mischka and Mia, his in-laws Stephanie and Alfred Calascione, Ian deCesare and his partner Sue, Kevin deCesare and Graziella deCesare, his nieces, nephews, Sally and Solange and his many friends. The funeral Mass will be held tomorrow, Tuesday, April 16, at Our Lady of Mount Carmel, Balluta parish church, at 8.30am. The family would like to thank Dr Karen Cassar and all the staff at Mater Dei Hospital for their care and dedication. MICALLEF. On April 13, at Mater Dei Hospital, JACQUELINE, of Xemxija, St Paul’s Bay, aged 53, passed away peacefully comforted by the rites of Holy Church. She leaves to mourn her loss her beloved sons Keith Abela and his girlfriend Nadine Azzopardi, Sam Abela and his girlfriend Jade Cali, her mother Carmen and her father Saviour Micallef, her sister Mervin and her husband Ivan Vella, her nephew Joseph and his partner Julia and their daughter Mia Nicole, her niece Anthea and her partner Andrea, other relatives and friends. The funeral leaves Mater Dei Hospital tomorrow, Tuesday, April 16, at 1.45pm for St Joseph the Worker church, Xemxija, where Mass praesente cadavere will be said at 2.30pm. No flowers by request but donations to Puttinu Cares would be greatly appreciated. Lord, grant her eternal rest. The family wishes that dressing will be casual. DEGAETANO. In loving memory of VINCENT DEGAETANO, A&CE, today the 34th anniversary of his passage to eternal life. Fondly remembered by his children, in-laws, other relatives and friends. A prayer is solicited. FARRUGIA – TESSA. In everlasting memory of a dearly beloved mother, grandmother and great-grandmother on the 12th anniversary of her death. So sadly missed and always in our thoughts and prayers. Gillian, Monica, Anne, Louise and their families. GRECH. In fondest memory of VINCENZA, née Gabarretta, a loving mother and grandmother, today the 34th anniversary of her death. Always remembered by her son Laurence and his wife Lilian, her daughter Grace and her husband Tony Naudi, and their families. MICALLEF – MARLENE. Treasured and unfading memories of a much loved mother and grandmother, today being the 11th anniversary of her passing away. Janice, Hugh, Jackie, Kenneth and their families. VON BROCKDORFF – VERONICA. Cherished memories of our dearest mother and grandmother on the second anniversary of her demise. Loved and sorely missed by her children David, Vanessa, Nicholas and Alma. Her grandchildren Michael, Sacha and Adam. Kindly remember her in your prayers. VON BROCKDORFF. In loving memory of VERONICA on the second anniversary of her death. Remembering the happy days. Gladys and Tony.